A beer brewed in the great tradition of English ales using 100% English ingredients. A base malt of Maris Otter gives this beer that bready flavor no other base malt has. And English beers have a characteristic malt flavor only found in crystal malts made in England. English maltsters make crystal malt that has a pronounced toffee flavor rather than a straight-up caramel flavor. This beer is the cornerstone of many beers Optimism brews because I fell in love with imported English ales as I was growing up and discovering the breadth of beers available outside America at the time. When I was homebrewing, I brewed this beer more than any other because it was never perfect and, as simple as the recipe is, could always be tweaked until I got it to my perfect beer. It’s the one beer I would have if I could only have one beer for the rest of my life – it goes well any time of day, any time of year, any occassion and with any food. Some people will call this an ESB (Extra Special Bitter) and, well, it technically is. While ESBs used to be one of the most popular beer styles in the world, no one drinks ESBs anymore because so many ESBs have a dull flavor. And no one likes the word “bitter” in a name. This beer is not bitter, it is malty rich with a wonderful grassy and floral bouquet. 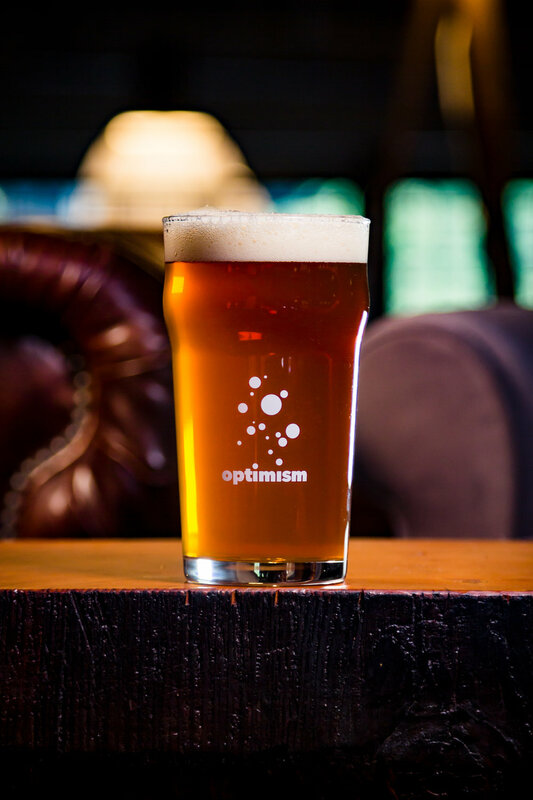 As you enjoy this beer contemplate your past and your future and realize that all the times you were confronted with pessimism, pessimism lost because optimism won. Optimism always wins because pessimism causes you to give up, relent and accept misery. Optimism drives you forward until you’ve defeated all the pessimists. Pessimists lose, optimists win. The beer is comprised of just 2 malts and 3 hops which create a surprisingly complex beer. This is the little sibling to Optimism One. It’s a balanced, all-day ale, meaning with a low ABV of 3.7%, you’ll automatically want another and another and still feel great the next morning. One is the beginning and a common denominator. If Troy could only have one beer for the rest of his life, it would be One. Also play on words, in the long battle of pessimism and optimism, optimism won. The English beer style nominclature is no longer helpful in today's world of hop-heavy IPAs. To English beer drinkers this is an extraordinarily bitter beer, but today's American craft drinking palate this is not bitter at all. So it no longer seems apt. To the uninitiated, "bitter" actually sounds terrible. Because E.S.B.s were some of the initial beers made during the craft movement of the '90s, they now seems like the beer "your dad drinks" and is therefore not cool. Everytime a bar has sold this beer as an ESB, it doesn't sell, but it has consistently been in the top 5 in our tasting room when there is no bias based on it being an uncool style.